It's the annual Sticker Fest in Decalburg, when a Sticker Comet is due to fall from the sky. As usual, Bowser appears, accidentally breaking the comet and scattering it across the land. 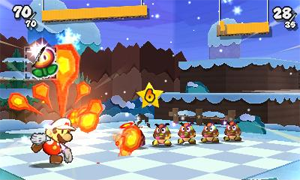 Mario teams up with a crown named Kersti to find all of the Royal Stickers. Only then can he restore the comet and stop Bowser's rampage. As you walk around the world, you can collect stickers, scrunched-up scraps and 3D objects. These can open new paths or be used in battle with Bowser's minions. You can also use Kersti's Paperize ability to turn the world into a stickerbook, using your collected stickers to reveal secrets.